Already part of Biscuit Basin, the Old Road Group connects the Cascade Group in the southeast to the Sapphire Group of Biscuit Basin in the northwest. Since the trail from Morning Glory Pool to Biscuit Basin is the only permitted way to hike within the group, only features close to the trail can be observed. At some points such as Mirror Pool small side branches of the trail allow to leave the forest for a better view. 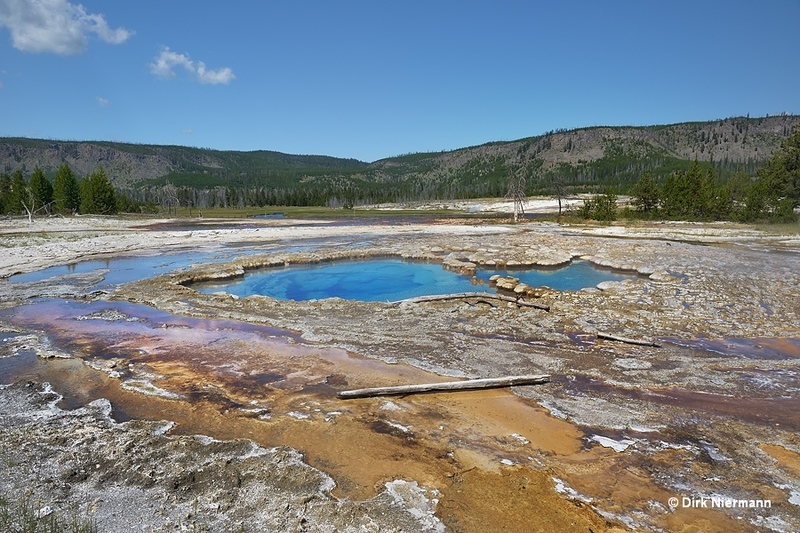 Mirror Pool is a large hot spring with stunning colors, but no geyser. North of Mirror Pool at a somewhat larger distance to the trail Cauliflower Geyser adjoins. It is named after the cauliflower shape of its sinter bulbs. The eruption height is usually in the range of a few feet at intervals between 20 to 40 minutes. 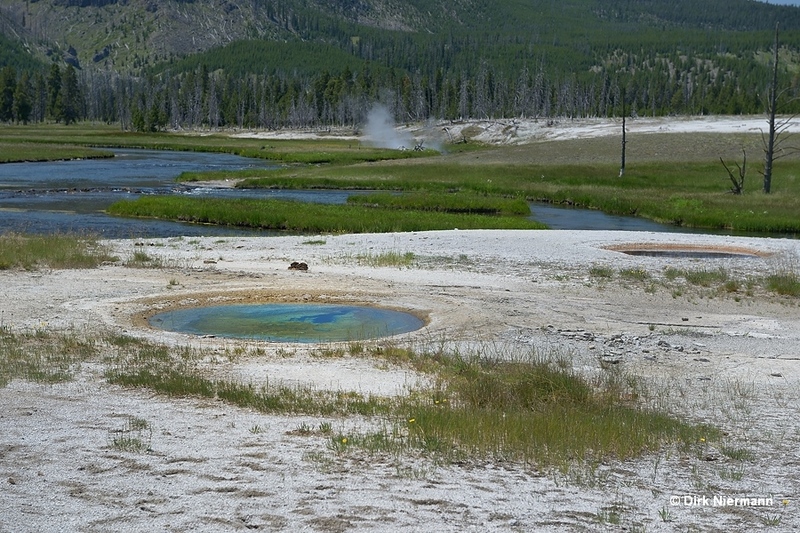 Other geysers along the trail such as Baby Daisy Geyser or Demise Geyser can only be spotted if they are erupting. 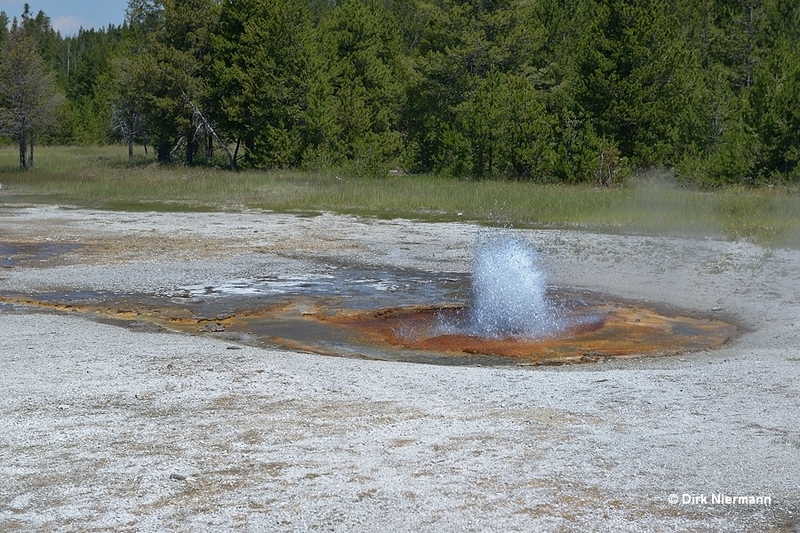 An exception is Mercury Geyser, located next to the trail at the north corner between the trail and the highway across from Biscuit Basin parking lot. However, its activity is highly irregular and dormancies are known. 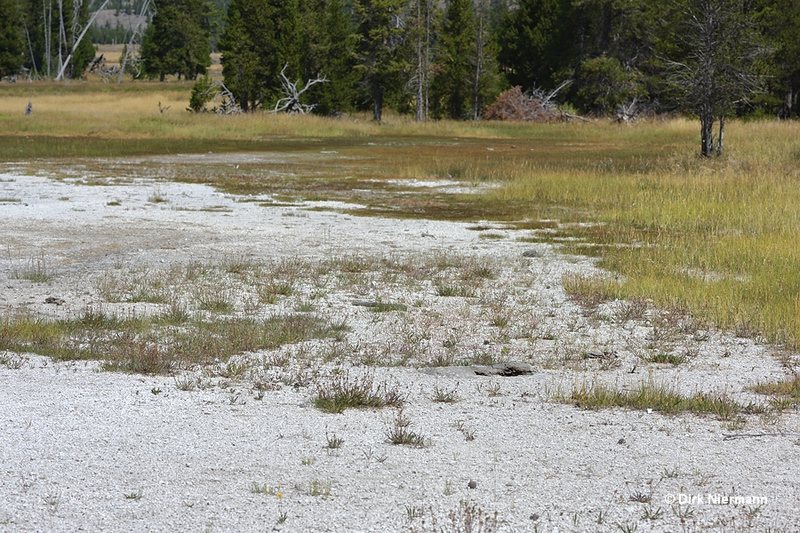 The features between the highway and Firehole River are belonging to the Old Road Group, too. 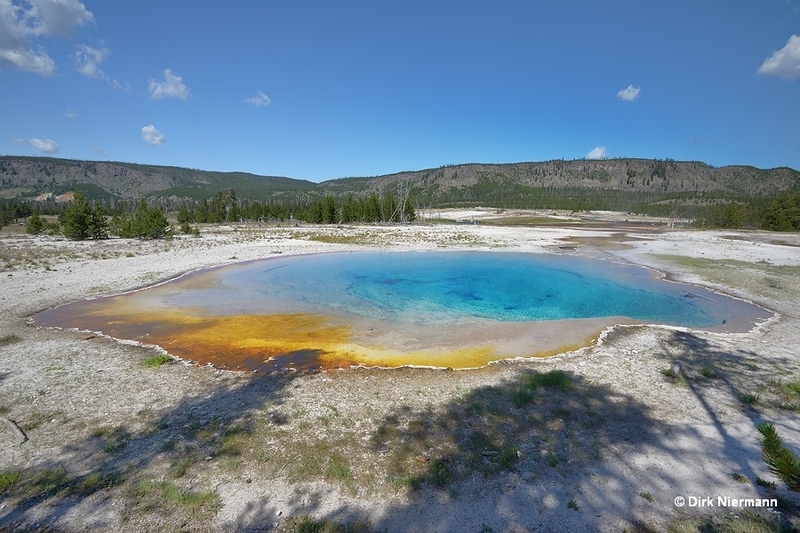 Most noticeable is the medium sized hot pool UBBNN001 on the north side next to the access road to Biscuit Basin parking lot. In the field beyond this unnamed hot pool Rusty Geyser shows up, with an extremely short interval of less than a minute. 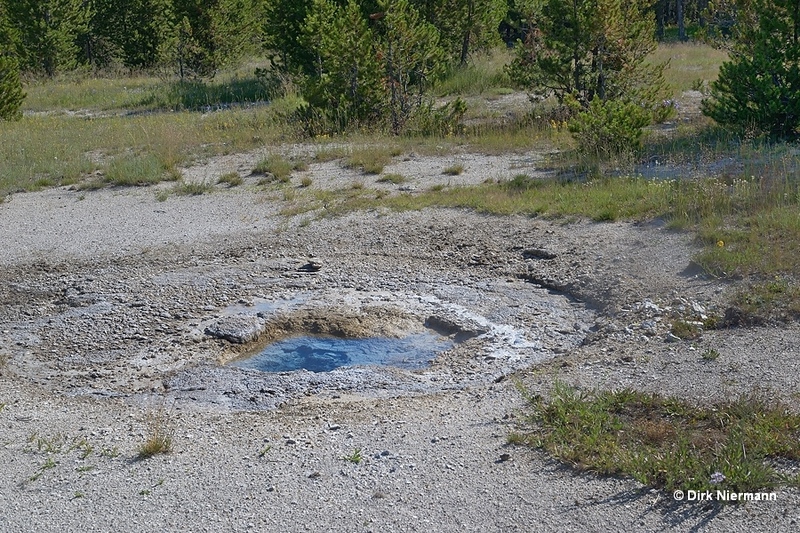 Detecting the gray ("dusty") vent of Dusty Geyser may need a second look because it is no more than a hole in an inconspicuously small sinter formation a few feet southeast of Rusty Geyser. Dusty was active almost exclusively in the 1970s and 1980s. 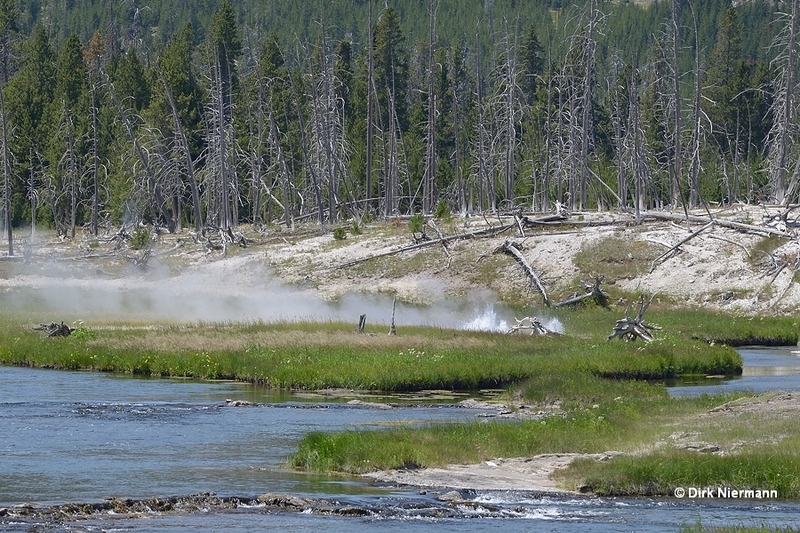 Across the access road the "Goldfinger Cluster" occupies the bank of firehole river. Easternmost feature and closest to the paved area is Goldfinger East Pool. A few feet farther west lies Goldfinger Geyser and beyond it Goldfinger West Pool. 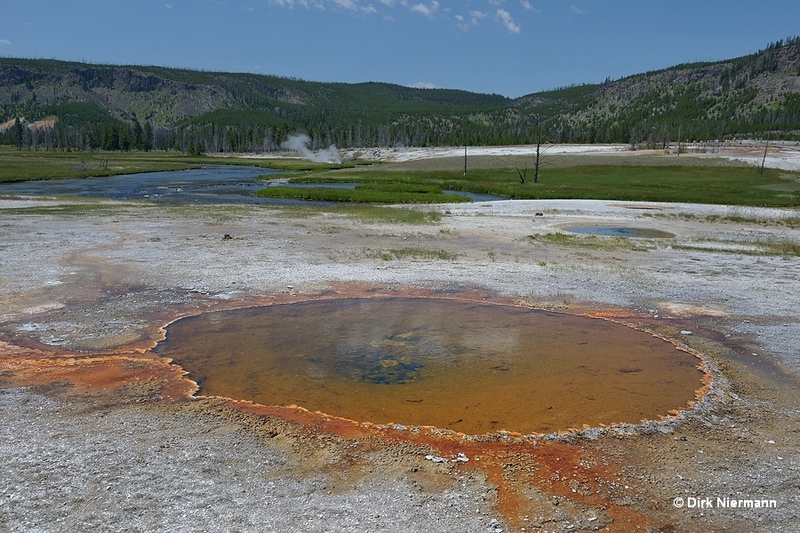 Goldfinger Geyser has been a perpetual spouter up until a few years ago, but is currently dormant. 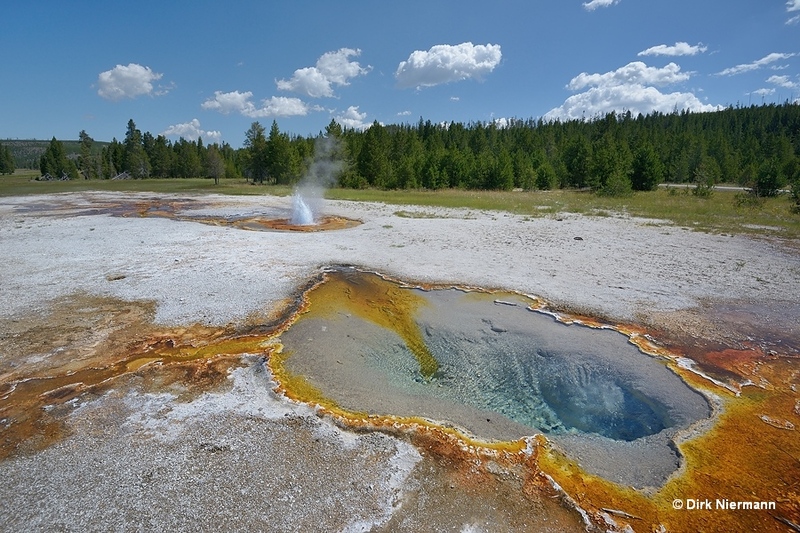 Island Geyser is located at a quite remote position on an island in Firehole River. Its up to 3 m (10 feet) high eruptions are near steady.